Heathrow's third runway: a much needed investment or 'big-willy politics'? "Heathrow alone serves more "key business" destinations than Paris and Frankfurt together." "Heathrow serves 156 destinations at the moment: that is fewer than six other airports including Charles de Gaulle in Paris with 224 and Frankfurt with 235. London has no direct daily flight to some of the world's most important growing cities, including Ankara, Jakarta and Guangzhou." Battle lines were drawn this week as senior Conservative politicians picked their side on the ongoing saga regarding Heathrow's third runway: Tim Yeo, Chair of the Energy and Climate Change committee, urged David Cameron to show whether he was 'a man or a mouse' by backing the scheme while Transport Secretary, Justine Greening, suggested that she would resign from the Cabinet if the Government went ahead with the construction. In this context, the Guardian and Times today made seemingly contradictory claims about Heathrow Airport's ability to serve business' demands, with the former emphasising that the airport is already a major international player and that further expanson would amount to 'big-willy politics' while the latter suggested that there was room - and a need - for expansion. We contacted the Guardian to see if they could provide any further details about the source for its claim but we are yet to hear back. We did, however, come across a report entitled International Air Connectivity for Business published by Airport Watch in August 2011, which might shed some light on it. The study investigated international flights from four of Europe's main 'hub' airports to 27 major international business destinations. The four airports in question were Heathrow, Charles de Gaulle (Paris), Schipol (Amsterdam) and Frankfurt. 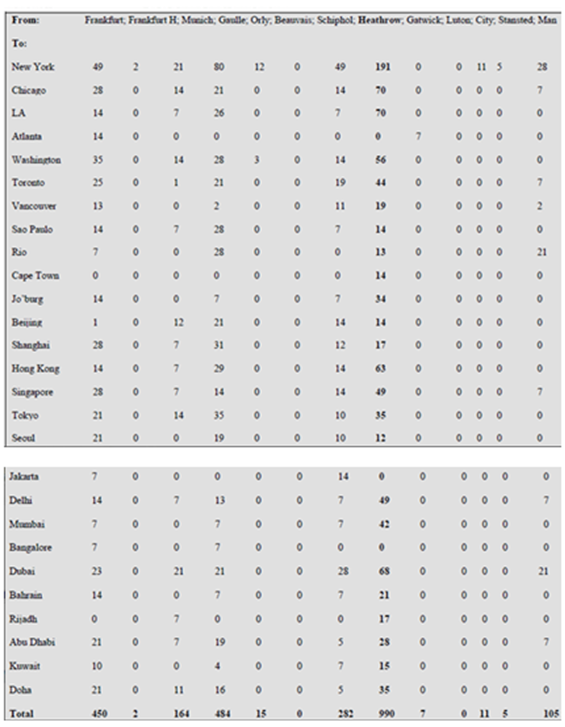 "counted the number of destinations served by each airport and the number of planes to each of the main business destinations during one week in the month of July." "Heathrow is 'in a class of its own' as far as its inter-connectivity to the key business centres of the world is concerned, with more flights to these business destinations than any other airport in Europe — in fact, more than the combined total of its two nearest rivals, Charles de Gaulle and Frankfurt." This seems to add weight to the Guardian's claim, although questions can be asked about the size and scope of the study. For instance, we don't know whetherthe week in question was typical for all four airports, and whether or not it's fair to use the 27 routes examined as a prxy for 'key business destinations' is a matter of interpretation. Ok, but what about the Times? "According to the report Heathrow which now serves 156 international destinations has fallen behind six other airports including Charles de Gaulle airport in Paris with 224 and Frankfurt with 235." The report in question seems to be A new airport for London — Part 1 by then Deputy Chairman of Transport for London, Daniel Moylan. Although an electronic copy doesn't seem to be available, we were able to get hold of one from TfL directly, who also told us that their source for the figures was research done by the Airline Network News and Analysis (ANNA). These figures are widely used in the industry, albeit with slight variations. For example, theairdb.com suggests that one can fly to 194 destinations from Heathrow; 295 from Charles de Gaulle; and 309 from Frankfurt International. These discrepancies in the number of reported destinations may be due to differing definitions of what constitutes as a 'destination' — for example, it is possible that one source counts cities while another counts airports — but we are unable to confirm this. What we can say, however, is that wherever we have looked, it seems that one can fly to more destinations from Frankfurt and Charles de Gaulle than from Heathrow. Nevertheless, not all of these destinations are major international centres for business. It is worth noting, for instance, that theairdb.com reports no fewer than 28 individual domestic destinations available from Charles de Gaulle but only 7 from Heathrow. Returning to the original quotation, the Times also points out that there are currently no daily direct flights from Heathrow to Ankara, Jakarta and Guangzhou which, following a quick look at the flight schedules, we can confirm. However, considering that this comment was juxtaposed with a comparison to Frankfurt and Charles de Gaulle, we thought it would be interesting to see what these airports had to offer. Interestingly, we have learnt that there are daily flights to Ankara from Frankfurt but not to Jakarta or Guangzhou and that there are daily flights to Guangzhou from Charles de Gaulle but not to Ankara or Jakarta. As such, it would seem that neither of Heathrow's main competitors are fully exploiting the potential flight paths to developing business centres. As we've seen, the claims made in the two papers are not necessarily mutually exclusive. Whether or not the status quo serves business's needs is therefore an open question, depending upon which set of figures you set more store by. Does the government subsidise airlines by £10 billion? Is Britain losing £1.2 billion to other countries because of poor flight connections?